3 March 11 Eat More Food! If you track calories, then you know that to lose 1-2 lbs of weight per week, you need to create a calories deficit of 500 – 1000 calories per day. As the days pass into weeks, achieving this deficit starts to get hard. Over time, most of us get very hungry and our cravings get magnified. We dream about food. The calories restriction feels punishing. What can we do to curb hunger while we lose weight or while we try to maintain our weight? Eat more veggies and fruits. You have heard it a million times. Why would eating more of these foods help you lose weight? Simply put, these foods are higher in water content so their energy density is much lower than other foods. When you consume these foods, they help you feel full. You get more volume of food for fewer calories. This helps curb your appetite and stay on track for both weight loss and weight maintenance. Energy density is simply the number of calories per weight of food. Fat provides 9 calories per gram weight; whereas protein or carbohydrates provide only 4 calories per gram weight. Lower fat foods will have lower energy densities than higher fat foods. However, what we often don't think about is how "wet" or "dry" our foods are and how that might affect our satiety or feeling of fullness during or after a meal. As you can see, non-starchy veggies and fresh fruit have the lowest energy densities. Notice that dried fruit is higher than fresh fruit since water has been removed (e.g. dried apple has 23 times more calories per gram than fresh apple). Also note that milk is lower in energy density than cheese made from that milk. Although there are outliers like avocado and nuts, generally, you can eat larger portion sizes of plant foods and still consume fewer calories. Include a variety of high and low density foods in your eating plan, but eat less of the high and more of the low energy-dense foods. 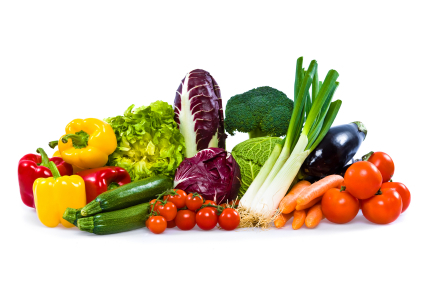 You can start by eating MORE fruits and vegetables to help you feel satisfied while keeping your calories in check. I recommend Barbara Rolls, Ph.D.'s "The Volumetrics Eating Plan" for the original resource on lower energy density eating. When combined with calories tracking, this is a very powerful strategy to reduce hunger while lowering calories, and all the while, increasing nutrient quality. For another method that focuses on meal composition (using lower energy-dense foods), explore the "Plate Method." This method will also help you control your carbohydrate intake at meals. Your plate should be composed of non-starchy veggies (1/2 plate), whole grains/starchy veggies (1/4 plate), lean protein (1/4 plate), one cup of skim or low fat milk (or dairy substitute), and 1 piece of fresh fruit.